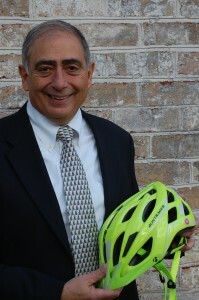 Dr. Gaston said he came up with the idea in 1996 when he served as the medical director for the governor’s Keystone Ride, an annual long-distance bicycling event throughout areas of Pennsylvania. He said he realized that many of the participants in the event carried no identification and medical info forms were stuffed into a manila folder. A better system was absolutely necessary. Dr. Gaston said he has spent about $10,000 developing the identification system, including the cost of materials and transportation to various industry meetings for marketing and development purposes. To get the ball rolling, Dr. Gaston said he began talking with his patients and friends about what he wanted to create and made some valuable contacts. An employee at D&K Inc. in Valencia, Butler County, helped him develop the envelope and referred him to Walco Industries in Glenshaw as a source for the double-adhesive tape. Once the manufacturers of the system were lined up, Dr. Gaston needed a place to assemble it all — which led him to contact his brother, who is a priest. “My brother had been a chaplain at Clelian Heights School for Exceptional Children (near Greensburg in Westmoreland County), and I knew they had a center there for vocational training,” Dr. Gaston said. The school’s students assemble the system kits and the school keeps Dr. Gaston’s inventory for him. Currently, Dr. Gaston distributes the product by partnering with the Progressive Workshop in Kittanning, PA. The Workshop assembles the packages and prepares them for shipping. This process provides steady work and income. The Workshop has proven to be an invaluable asset to the success of Medical Emergency Data Systems. The Medical Information Carrier has been deemed a “win-win-win” product. The Company continues to grow, the workshop partners are gainfully employed and the riders receive a life-saving helmet safety device. Designer, US Army Tactical Vehicle Combat Safety S.E.A.T. President, Medical Emergency Data Systems, Inc.